Better regulation matters. Legislation is not an end to itself – it is a means to deliver tangible benefits for European citizens and address the common challenges Europe faces. Well-targeted, evidence-based and simply written regulation is more likely to be properly implemented and achieve its goals on the ground, whether these are economic, societal or environmental. Modern, proportionate rules that are fit for purpose are essential for the rule of law and upholding of our common values, but also for the efficiency of public administrations and businesses. The European Union has frequently been criticised – often rightly – for producing excessive and badly written regulation and for meddling in the lives of citizens or businesses with too many and too detailed rules. Reports abound, whether founded or not, of cases of misguided regulation or rules that apparently micro-manage aspects of daily economic or social life. At the same time, citizens' expectations are that Europe should focus more on providing effective solutions to the big challenges – jobs and growth, investment, security, migratory flows, and the digital revolution, to name but a few. From the start of its mandate, the Juncker Commission made clear that we would break with the past and change the way the Commission works and sets its policies, by putting better regulation principles at the heart of its policy-making processes, to make sure its policies deliver better results for citizens, businesses and public authorities. We committed to be big on the big things and small on the small things, by focussing our action on those issues that really matter to our citizens and where European action is most necessary, and making sure that Member States take responsibility where national action is more appropriate. And we committed to engage in a close partnership with the European Parliament and the Council and to cooperate closely with the Member States to shape the agenda and set joint political priorities, so that the European institutions, together, can deliver a better, more focused Union. Concentrating on measures that are really necessary and not doing things that have only marginal benefits or can be better done at national, regional or local level in Member States, also frees up space and means that collectively the institutions can mobilise more quickly to address new circumstances, as has been the case in the migration crisis. Nearly two years into its mandate, the Commission is on track to deliver on our better regulation commitments. From the start, our work has been framed by a focused set of political guidelines 1 to steer action over the medium term on the key challenges facing the EU: jobs, growth and investment; migration; security; digital; energy; or the deepening of the single market. Every year, concrete measures reflecting these strategies are set out in yearly, focused and streamlined Work Programmes. There were 100 initiatives in the Work Programme of 2014. In 2015, the Work Programme counted 23 new priority initiatives and packages. There were also only 23 in 2016. 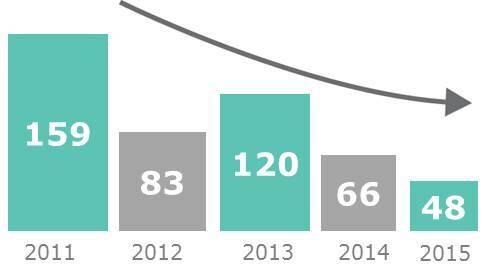 At the same time, the number of proposals for regulations and directives made by the Commission for adoption by the European Parliament and the Council under the ordinary legislative procedure has declined from 159 in 2011 to 48 in 2015. Since 2000, the number of directives and regulations adopted by Parliament and the Council under the ordinary legislative procedure has varied annually, with the highest level of legislative output 141 in 2009. In 2015, the first year of the Juncker Commission, 56 pieces of legislation were adopted. Not only does the Commission strive to focus on what is necessary and matters for citizens, but also to fight inertia. 90 proposals that had become outdated or which were not advancing in the European legislative process have been taken off the table of the co-legislators over the past two years, to allow the focus to be on the priority files. The existing body of EU law was reduced by abolishing 32 outdated laws, and work was launched to simplify existing rules in some 103 areas. Better regulation also requires regulation to be prepared in full knowledge of its expected effects, to maximise positive impact and avoid unnecessary burdens and red-tape on citizens, businesses and public authorities. Part of the Commission commitment to better regulation is thus to stick to evidence-based rule-making. Before new legislation is proposed, the Commission thoroughly evaluates past experience, studies and consults on possible impacts and assesses whether action should be taken by the Union or is best left to the Member States. Better regulation is not the sole responsibility of the European Commission; it is a joint endeavour with the European Parliament, the Council and the Member States as each has roles and responsibilities to fulfil. Nor is it a matter of concern only when new legislation is prepared and designed. At any stage in the policy cycle, from legislative negotiations between Parliament and Council to transposition and implementation by the Member States and the Commission, better regulation should come into play. To succeed, we all need to focus, to be effective, to simplify, to be transparent and to act at the right level. Over the past year, the Commission has made progress in delivering results within President Juncker’s 10 priorities. We have focussed our work on major initiatives with high EU added value in terms of tangible results for citizens and businesses and have reacted quickly to emerging challenges which require rapid, yet sound, responses. In many cases, the Commission was able to prepare and present initiatives in record time, with evidence-based analysis of their impact proportionate to each specific situation. Respect of the better regulation principles helped shape proposals which did just what they needed to do, and could hence be the subject of timely adoption by the other institutions, as has been the cases for example in relation to tax avoidance measures. Examples of being "big on the big things"
the Commission proposed an Investment Plan for Europe, adopted in 2015. In one year, the Fund mobilised €116 billion in new investment across 26 of our Member States. It has helped to create more than 100,000 new jobs so far. 192 financing agreements have been approved, giving 200,000 small businesses and start-ups better access to finance. Fostering innovation through a Digital Single Market: The Commission proposed to eliminate the key contract law-related barriers hindering cross-border supply of digital content and online/distance sale of goods. 4 Impact assessments showed that harmonised rules for digital content products will reduce the costs for traders and encourage them to expand across borders. At least 122,000 more businesses are expected to start selling online to other EU countries with between 8 and 13 million additional consumers. Building an Energy Union and combatting climate change: In February 2016, the Commission presented new measures on energy security, which will improve interconnections across Europe and minimise risks of interruptions of supply. Solidarity among Member States will help to protect households and essential social services in cases of crisis. The Commission steered the work leading to the Paris Climate Change agreement and is following up on the European Union's commitments on binding annual greenhouse gas emission reductions by Member States from 2021 to 2030 5 , including the modification of the EU's Emissions Trading System to enhance cost-effective emission reductions and low-carbon investments. A thorough impact assessment helped shape a proposal that was proportionate and that ensured fair effort sharing amongst the Member States, the protection of industry's international competitiveness and more and better investments in low-carbon technologies. Combatting tax evasion and avoidance: In November 2014, leaks threw light on the sometimes abusive use of tax rulings. The Commission quickly defined a wide-ranging agenda for fairer, simpler and more effective corporate taxation in the EU. The Commission proposal on automatic exchange of information on Member States' tax rulings was presented in January 2015 and adopted by the end of the year. Proposals on the reporting by multinational companies of tax-related information and exchange of that information between Member States and for proposal for an Anti-Tax Avoidance directive were tabled in January 2016 and agreed in March 2016 and in June 2016. Better regulation leads to simpler rules that can deliver more effective results. The Commission has continued our efforts to simplify existing legislation. Since the launch of the Regulatory Fitness Programme (REFIT) 6 almost 200 initiatives for burden reduction and simplification have been launched. Examples include: reduced financial reporting for 5 million micro-businesses (with estimated annual savings of about €6.3 billion); a reduction of up to 95% in the registration fees for SMEs required by chemicals legislation (REACH); and new electronic procurement rules which are expected to reduce procurement costs by up to 20%. The Commission presented an action plan on VAT on 7 April 2016 8 which announced major simplification initiatives including a proposal (to be presented in the autumn) to modernise the VAT system for cross-border e-commerce. This could lead to increased VAT revenues of €7 billion annually while decreasing business compliance costs by at least 55%. The Effort Sharing Decision proposal for binding annual greenhouse gas emission reductions by Member States from 2021 to 2030 will reduce administrative costs associated with compliance monitoring and reporting by approximately €345,000-460,000 per year. This will be complemented by further simplifications in monitoring and reporting across energy and climate-related legislation later this year. The Commission has proposed to overhaul prospectus rules to improve access to finance for companies and to simplify information for investors. Small and medium-sized companies in particular will find it easier to raise funding when issuing shares or debt. More proportionate disclosure rules could translate into savings of about €130 million euro per year (based on the public consultation results). 9 An EU prospectus would only be required for capital raisings above €500,000 (up from €100,000). Less complex prospectuses would also be required for smaller issuers who want to tap European markets. The proposal to simplify EU financial rules (recasting the Financial Regulation and amending 15 legal acts setting out sectoral financial rules) - adopted as part of the MFF midterm review - proposes a single EU financial rulebook cutting 25% of the current rules by combining the applicable rules of the various EU funding tools whenever possible. An ambitious simplification agenda is underway for the Common Agricultural Policy, where over 20 simplification actions have already been finalised to the direct benefit of farmers and also national administrations. Further proposals are ongoing on greening in the context of REFIT. In addition, an action plan for the rules on agricultural markets is underway, aiming for a substantial reduction of the initial 250 Commission Regulations to around 20 delegated and 20 implementing acts. A new data protection regulation has established a single, pan-European law replacing the 28 different laws of the Member States. This will reduce administrative burdens and make it easier for many companies to access new markets. The new rules will bring benefits of an estimated €2.3 billion per year 10 . At the same time, the Commission strengthened its transparency portal and transparency register to open up and facilitate participation in the EU decision-making process 13 and is publishing negotiating texts and other documents relating to international trade negotiations. The Commission also established the "REFIT Platform" to bring stakeholders and Member States into the Commission's REFIT work. The Platform brings together high-level experts from all 28 Member States, from the European Economic and Social Committee and the Committee of the Regions and from business, social partners, and civil society appointed through an open and transparent process. Via a dedicated website 14 stakeholders with concerns or suggestions are able to present their views on the impact of EU laws to the Platform and suggest how the legislation can be improved. The Commission will report on its intended follow-up in context of the Commission Work Programme for 2017. The track record so far shows that the Commission's commitment to better regulation is not just lip service. It is a fact. Changing the way regulation is prepared, engaging more transparently with stakeholders and listening to their input systematically were powerful drivers for a change in the quality and focus of Commission proposals. In many cases, better regulation tools helped reduce or avoid unnecessary costs, address the specific problems identified by stakeholders 19 and deliver more proportionate approaches, which impose less burden collectively. A greater decentralisation of the handling of state aid: almost 90% of state aid cases are now managed by the Member States without prior approval from the Commission. Better regulation is about getting the European Union work better and transparently, with a strong focus on acting in a simpler way and only where it matters for citizens. This is a job for all institutions, and for the Member States. Everyone has stakes in it. The Inter-institutional Agreement on Better Law-making reached by the European Parliament, the Council and the European Commission, which entered into force in 2016, marks a significant step forward in the culture of better regulation. But better regulation is in itself a dynamic agenda. More action is needed. Staying the course: The 10 priorities of the Juncker Commission will continue to form the basis of the Commission’s 2017 Work Programme, with a focus on the proposals which are most crucial to address the challenges that the EU is currently facing. As was the case in the last two years, only proposals for which a good case is made will make their way into the Work Programme, and they will be prepared on the basis of a prior assessment of impacts, building on feedback from stakeholders through public consultation. The work of the REFIT Platform, which is starting to produce its suggestions and recommendations, will bring a value added to the process. Areas to be examined for possible improvements and simplification will include chemical legislation, occupational health and safety, financial services, VAT and the Common Agricultural Policy. Working together: Ensuring that EU citizens can benefit from simpler, clearer and better targeted regulation is not a task for the Commission alone. A change in the culture of law-making at EU level can only happen if all the actors involved buy into this agenda and play their role. The Commission is pushing ahead to implement its commitments under the Interinstitutional Agreement on Better Law-making and looks forward to working together with the European Parliament and the Council. Stepping up enforcement: Often it is not the lack of EU legislation that is the source of problems. It is rather the lack of its effective application and redress for citizens. There is still a significant gap between what is in the EU rule book and the rules applied on the ground. The Commission is stepping up its efforts on application, implementation and enforcement of EU law. The partnership with the Member States is key and needs to be reinforced and strengthened throughout the policy cycle. The Commission will also work with the Member States to ensure that citizens can easily have access to information on how EU rules are implemented at national level and what are their rights in terms of redress. The Commission puts particular emphasis on those infringements that have a significant impact on the attainment of important EU policy objectives. At the same time, it will systematically monitor if national law complies with EU legislation and make greater use of the possibility to propose financial sanctions to the Court of Justice if Member States fail to translate EU law into their national legal order in a timely manner. –Re-casting - a technique used to bring together in a single new act the original legislative act and all the numerous subsequent amendments made to it - should be the main legislative method to produce a single, clear, comprehensible legislative text. Where re-casting is not possible, the option of codification should be pursued. The Commission will produce a programme of regulations to be subject to recasting and the expected timeline. The close cooperation of the three Institutions will be key to ensure effective follow-up. –The simplification and burden reduction potential in Commission proposals should be maintained and improved in the legislative process. Proposals designed to bring immediate benefits to citizens and business should be prioritised. –In line with the Interinstitutional Agreement, the European Parliament and the Council should step up their own internal impact assessments work to support their substantial legislative amendments. The European Parliament has so far assessed the impacts of around 30 of its amendments, while the Council has assessed none and is still currently examining when and how it should prepare such assessments. As a reference, since 2003, the Commission has prepared nearly a thousand impact assessments to support the proposals it adopts. –The EU Institutions and the Member States should work more closely together to ensure better monitoring, measurement and evaluation of the actual impact of EU regulation on the economy, social structure and environment in the Member States. The European Parliament and the Council are invited to cooperate and work with the Commission to develop the methods and tools necessary to apply better regulation and implement the commitments under the Interinstitutional Agreement on Better Law-making. Furthermore, and for the first time, this year the three Institutions will cooperate to identify, on the basis of the Commission Work Programme, a set of proposals that will be prioritised in the legislative procedure. This will ensure greater ownership and a fast track examination of the most important proposals. The EU is often blamed for red-tape and regulatory burden. But sometimes citizens and business discover that it is the national governments themselves that have added extra rules in the process of transposition into the national legal system, gold-plating those from the EU. The new Interinstitutional Agreement tries to bring clarity and accountability in the way Member States implement EU rules. From now on, the Member States should inform the Commission and explain to their citizens, whenever they add additional requirements to Union law in their national legislation. The Member States are also invited to work closely with the Commission to ensure the timely and correct transposition and application of Union law. Staying the course: The Commission Work Programme for 2017 will remain focused on few, well selected initiatives bringing forward within the 10 priorities measures that will tackle the most pressing challenges the EU faces today, and will include withdrawals of obsolete proposals and simplification suggestions following up on the first results of the REFIT Platform. Being transparent: The Commission is committed to enhanced transparency in its contacts with stakeholders and lobbyists. The Commission will shortly propose a new transparency register to cover the Council as well as the European Parliament. Reporting on burdens: The Commission will present an “annual burden survey” to the European Parliament and to the Council including an assessment of the feasibility of objectives for burden reduction in key sectors. Stepping up enforcement: The Commission will present a Communication on the application of Union law to promote a more effective application, implementation and enforcement, in line with the Commission's political priorities. (12) The Commission invites feedback from stakeholders in an 8-week period following adoption of its proposals and makes this available to the European Parliament and the Council of Ministers during the legislative process. This has proven its success recently in the case of the Commission's proposal on firearms which attracted 27680 responses the overwhelming majority of which came from individual citizens and helped inform the legislator's political stance. (15) The Platform's work including its recommendations can be seen at: http://ec.europa.eu/smart-regulation/refit/refit-platform/index_en.htm#members . The Platform adopted 17 opinions on 28 June 2016 in areas including chemicals, communication networks, competition, environment, financial services, health and food safety, internal market, taxation and statistics.